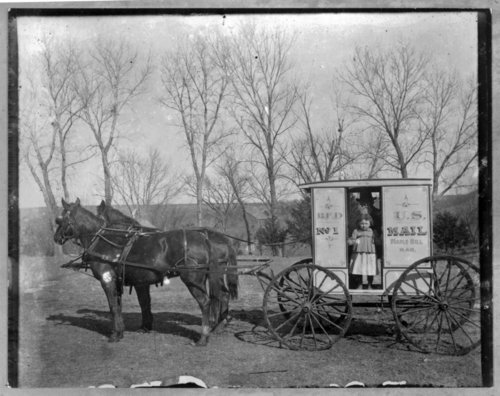 These two black and white photographs show the first Rural Free Delivery wagon for the U.S. mail in Maple Hill, Kansas. In the first image Mr. Joe Boyd, is seated behind the horse-drawn wagon as a unidentified girl stands in the cab of the vehicle The second image show two women and three children informally posing with Mr. Boyd and his wagon at a unidentified location. The wagon is label R.F.D. No. 1, U.S. Mail, Maple Hill Kan.